OMG!!! It’s real, and its perfect. I cannot wait! Shouldn’t we all go together? Wow! We live on the East Coast, so Disney World is much closer, but this would totally be worth the trip! we are totally going this summer! Now if we could just get an opening date!!!! 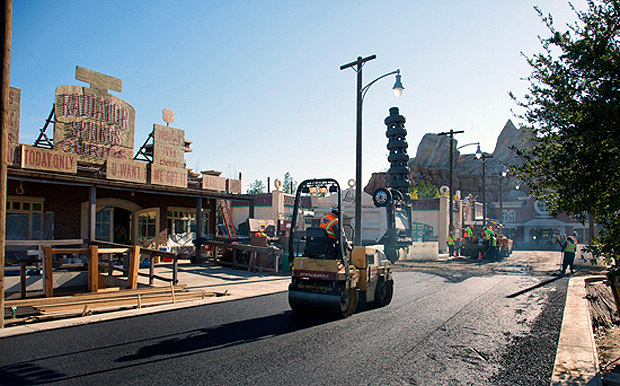 Is there an estimated opening date for Cars Land yet? (MET: I would presume sometime after June 15 and before July 4th? That’s probably what they’re aiming but haven’t anounnced a date just in case something goes awry – but I’m guessing before April, they should lock down a day – it looks like they are pretty much just adding the final touches). Thanks, Met, for the update about the date… I’m sure you’ll keep up informed. What happened to the ability to edit our posts? But seriously, everything looks incredible! My wife and I have been debating if we want to go this summer or not. The kids are finally old enough where we don’t have to worry about strollers and bottles, etc. That tire ride looks like a lot of fun. Looks like it will be so much fun!